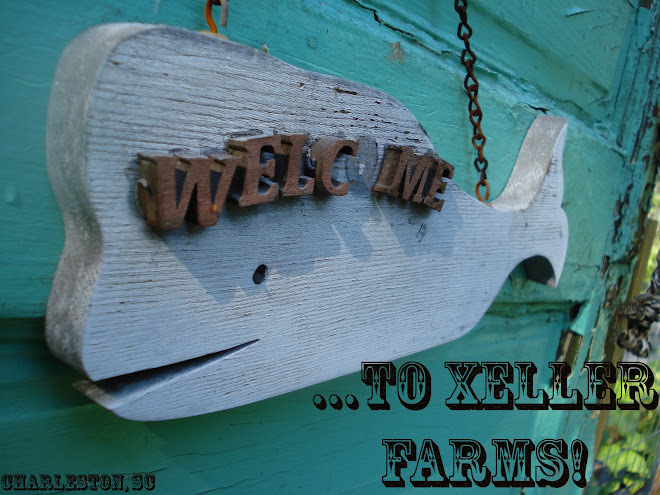 Xeller Farms: Look what I did today! I did it. I put together the rain barrel, set it up and I painted it, too. I figured today would be the day, since the weather was supposed to be "cool." Yeah, right. It's 72, which is still hot to me when you're working in the sun. Anyways, here it is. The only thing I need now is a hose or something for the overflow and it's all done. I painted it blue and black because those were the only colors we had in the shed. I would have picked dark and light green if I had the choice, but... beggars can't be choosers, right? I think it turned out nice nonetheless. I got the idea for the pattern from a website I found online. Here's an upclose look at the barrel with all its parts. It is leaking just the tiniest bit right now, I'm not too concerned, I will see if this gets any worse. You might just be the most industrious person I know, Svenja! I want a rain barrel! Of course, I don't have a garden this year but next year, I'm all about a rain barrel! Thanks! I really need to get working on an overflow barrel.